The Flemish government has decided that the financing of certain consolidated public institutions will be conducted by the central treasury of the Flemish Community. Before those public institutions raised their own debt directly through to the financial markets, in most cases with a guarantee of the Flemish Community. The central treasury will now borrow directly in its own name for the purposes of financing those consolidated public institutions. The first issues in the second half of 2015 showed a decrease in the interest rate by 20 to 30 base points compared to the guaranteed loans. The transfer to the consolidated public institutions of these funds (no ESA-impact) is part of the budget. Redemptions and interest (no ESA-impact) are also budgeted, both in the budget of the institutions as in the budget of the Flemish Community. As of 2016 the amount of such transactions and the financing needs of the Flemish Community on the capital markets will amount to approx. 2 billion euro per annum. 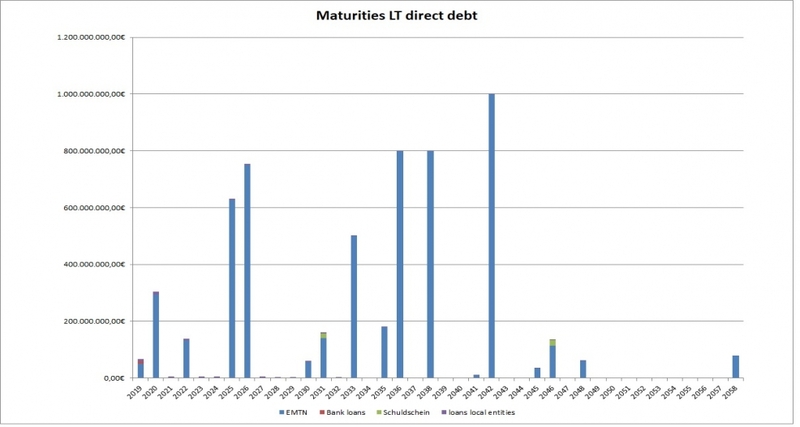 The chart below shows the redemptions of the direct debt over the next 40 years. The Flemish Community has the intention to build a reference benchmark curve in the future.